This post is from our new friend Rob Joncas you can find him on twitter @ROMcomROB. He runs a site called http://once-a-penguin.blogspot.com/ where he delves deep into +Pittsburgh Penguins history and recounts some amazing stories. 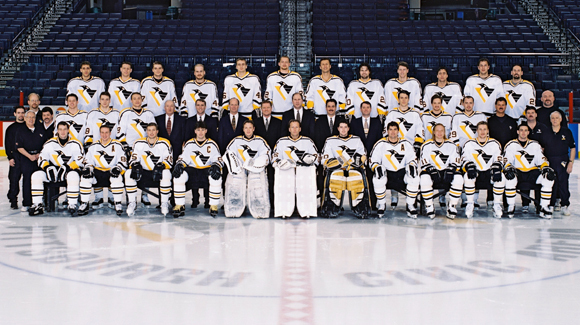 The late 90’s were a time of great uncertainty for the City of Pittsburgh, the Penguins, and most importantly, us. I personally knew there was some trouble brewing in the Steel City, but being as Toronto is the closest NHL team to my proximity, I would only get the table scraps of stories from the ‘Burgh as coverage in my area tends to be Leaf-Centric. Let's go back to November 1998 and look at some of the circumstances behind one of the biggest events in Penguin's history. After years of mismanagement of funds and assets on and off the ice by bungling ownership groups, the Penguins were forced to officially declare bankruptcy. In excess of 90 million dollars was owed to various creditors. 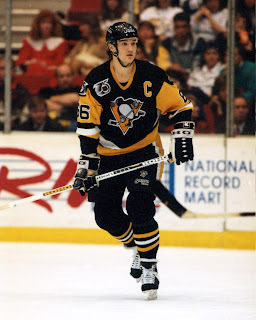 The single largest creditor was Mario Lemieux. Lemieux was owed 32 million after years of deferring his salary in order to help keep the team afloat. So, after the Penguins were eliminated by the Toronto Maple Leafs in the 1999 Eastern Conference Semi-Finals, (ironically, it was former Penguin Gary Valk that drove what may have been the final nail into the oblong box that contained Pittsburgh's hockey dreams) many wondered if the Penguins' days in Pittsburgh were numbered. It seemed it was a forgone conclusion that the team was going to move. A bankruptcy court was set to rule on the future of the Penguins a month after the season ended and it seemed everyone was a little apprehensive about showing much emotion or adulation for the current crop of Penguins. There were no “Save the Pens” rallies. No mass demonstrations at city hall. No one going on hunger strike. There was an online petition that had several thousands of names adorned to it, however the majority of those names did not even reside in Pennsylvania. It appeared that people were ready to accept whatever the outcome was going to be. I can understand why the majority of Penguins fans thought it was just another false alarm. Ever since the Franchise’s inception in 1967, there has been the spectre of loss hanging over the city. A common theme that appears every few years and echoes in the present day. It is hard to ride on that kind of emotional roller coaster. Compounding the Penguins financial woes, The “SMG” group that operated the Civic (Mellon) Arena for the city of Pittsburgh were bound and determined to hold the Penguins to the 6 million dollar a year lease. A new ownership group headed by Mario Lemieux was advocating for a yearly lease that was right around 500,000 a year. Would you be willing to leave 5 and ½ million dollars on the table? Probably not and neither was “SMG”. In the end, we know how the rest of that summer played out. A saviour would come in the form of a familiar French-Canadian face. Today, we can take solace in the fact that Penguins are firmly cemented in Pittsburgh and the team leaving is something we will not have to contend with.